*This section details how the PTO balances can imported into the Microsoft Dynamics 365 for Finance & Operations. 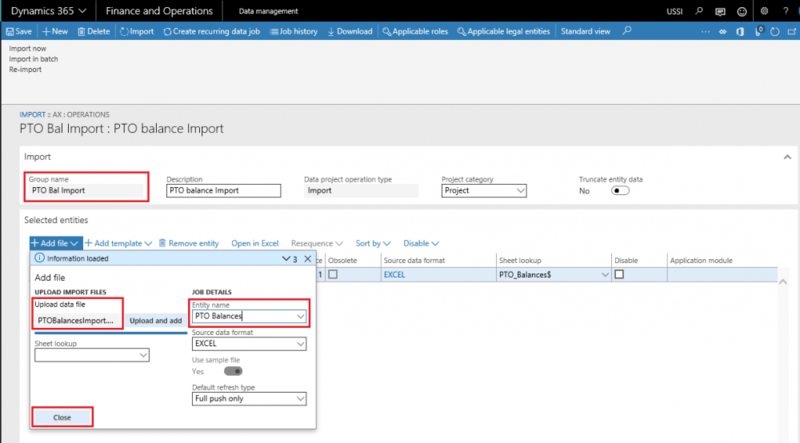 The PTO balances can be imported into the Microsoft Dynamics 365 for Finance and Operations using the ‘PTO balances’ data entity created to facilitate this process. Email ID Email ID of the resources for which PTO balances to be imported. Personnel number Personnel number of the resources for which PTO balances are to be imported. PTO balances Balances (number of hours) against each PTO type for resources for whom data is to be imported. PTO type Type of PTO i.e. sick leave, vacation, etc. for resources for whom data is to be imported. Resource name Name of resource in column for whom data to be imported. One of these fields, Email ID, Personnel number or Resource name should be specified in the import file. The logic used to retrieve the resource information is as follows: Get the resource information based on Personnel number, If Personnel information doesn’t exist then it gets it from Email ID, if email ID also doesn’t exist, then it gets the resource information based on the resource name. The PTO balances field takes the values in terms of hours and not days, so it converts your values into hours as necessary before importing. Once the import process is executed, for success or failure you should see the Execution summary.